Guaranteed to unite EVERYONE in the room within minutes & get your people talking! Guaranteed to unite everyone in the room within minutes, Afrobeat’s Interactive Drumming has the power to connect strangers, facilitate engagement, and get people talking - instantly! Let’s face it! Connecting large groups of people on any occasion can be a challenge - Especially if they don’t know each other. 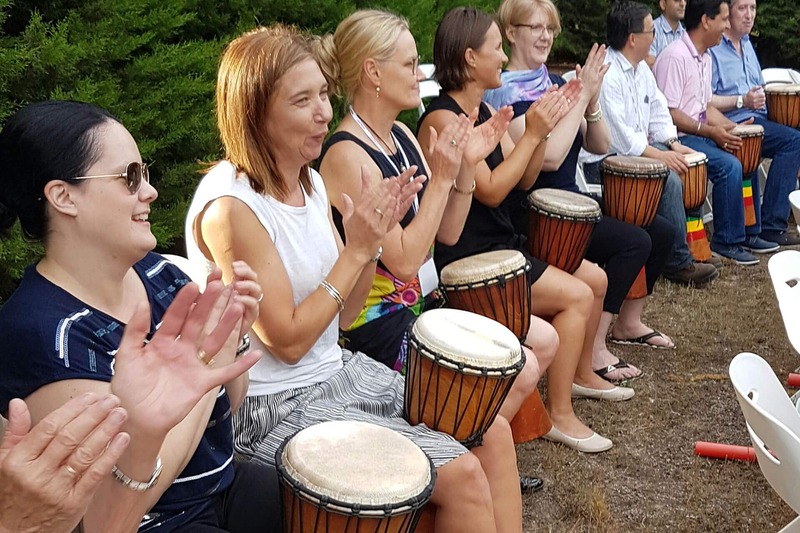 A networker’s dream, Afrobeat’s Interactive Drumming takes the ‘awkward’ out of new introductions, generating laughter and conversation, getting your people feeling connected, uplifted, energised and inspired – the effect is immediate and infectious! Drumming together is an equaliser that helps remove social barriers in a non-intimidating, fun atmosphere – allowing all ages, abilities, backgrounds, company status, and levels of experience to achieve success on an equal playing field ‘together’. So if you want to help participants or guests get to know each other, relax, gain enthusiasm and the necessary confidence to fully participate and feel comfortable with each other, get them drumming FIRST! Afrobeat gets even the most reluctant drummer to add their beat! An ice breaker doesn't have to be time consuming. In fact a good ice breaker can last as little as 10 minutes and have a great impact. Afrobeat offer a range of interactive ‘ice breakers’ including our Interactive Drumming Show, Boom Whack N Groove, Clap Percussion, and Stick Beats. So if you want to lighten the mood, introduce people to one another, impart a message, or open up your theme or topic of the day with an activity that’s sure to leave a lasting impression – Drum with Us! Loved it! Afrobeat provides a hands-on, energetic program that has students engaged from the moment the workshop commences. Its high energy, participatory nature provides a dynamic learning opportunity for students of all ages. I’ve heard lots of compliments of how comfortable you personally made all of the attendees feel and everyone felt very at ease from the start. So a huge thank you and I will definitely be recommending you to everyone! A vibrant, energetic performance thoroughly enjoyed by the students and staff that enabled full participation while capturing our school’s themes. Firstly – easy to deal with and responsive. Then great energy, worked the room, engaging and lots of fun. A completely different, high impact 45 minutes that beats other team activities! It truly is an unforgettable experience for students and staff alike and at the heart of it is a driving rhythm that brings the school community together in a magical way. AMAZING!! EVERYONE LOVED IT! WORTH EVERY CENT! Afrobeat were beyond brilliant. Words can’t really describe how fantastic it was. THE ENERGY THAT AFROBEAT BROUGHT TO THE SCHOOL WAS INCREDIBLE, I FELT MOVED BY THE EXPERIENCE.